Analysis: Mays was drafted by Green Bay as a seventh-rounder back in 2017, but he was largely limited to special teams there and only notched one rushing yard on four carries when he was given a chance on offense. It's now possible he could get another chance to prove his worth in Cleveland should injuries strike either Nick Chubb or Duke Johnson. Analysis: Mays spent the preseason dealing with a nagging hamstring injury and was ultimately waived/injured by Green Bay. The 2017 seventh-rounder is now free to look for a home elsewhere in the league. Analysis: Mays has been dealing with a nagging hamstring injury that prevented the running back from participating in any preseason games this summer. The 2017 seventh-rounder is now stuck on IR through the end of the league year, barring an injury settlement. Analysis: Per Wood, there's been talk that the two sides are discussing an injury settlement, which wouldn't allow the Packers to re-sign Mays to the practice squad. With a hamstring injury still in tow, another organization may not take a chance on Mays either, while agreeing to a settlement would hurt his chances of returning to Green Bay. Analysis: Mays has not played all preseason and is in serious danger of missing the Packers final roster. With Aaron Jones suspended for the first two games of the regular season, Mays looks to be competing with Joel Bouagnon, who has 29 rushes for 76 yards and a touchdown so far this preseason, for a spot on the active roster to open the campaign. Mays (hamstring) returned to practice Monday, Wes Hodkiewicz of the Packers' official site reports. Analysis: Mays missed about three weeks of the preseason due to a hamstring injury, and he finally seems to have recovered. Even with Aaron Jones suspended for the first two games of the regular season, it's hard to imagine Mays carving out a notable offensive role behind Jamaal Williams (ankle) and Ty Montgomery in the backfield. Mays will compete for a depth role through the end of the preseason, and he isn't a lock to make the 53-man roster. Mays (hamstring) won't practice this week and is slated to miss Friday's preseason tilt against the Raiders as a result, Ryan Wood of the Green Bay Press-Gazette reports. Analysis: Packers coach Mike McCarthy said Mays' hamstring evaluation was not encouraging and the issue will continue to be a major roadblock in his quest to make the 53-man roster. With Jamaal Williams (ankle) and Aaron Jones (hamstring, suspension) limited this week, Ty Montgomery and Joel Bouagnon figure to see additional opportunities at running back heading into Week 3 of the preseason. Head coach Mike McCarthy indicated Friday that Mays (hamstring) will be evaluated again Sunday, Michael Cohen of The Athletic Wisconsin reports. Analysis: Mays has not practiced for a while as he continues to battle injuries, but the reevaluation Sunday should provide a little clarity on his status moving forward. When healthy, Mays is in the mix for a depth role at running back for the Packers, but continued absences could hurt his chances of securing a 53-man spot out of camp. Mays (hamstring) didn't play in Thursday's preseason win over the Steelers. Mays (hamstring) will not play in Thursday's preseason opener against the Titans, Michael Cohen of The Athletic Wisconsin reports. Analysis: While it's possible Mays is being held out for precautionary reasons, the running back has nonetheless been out of commission for a week after injuring his hamstring in training camp in early August. Mays' next opportunity to see exhibition action is next Thursday against the Steelers. Mays left Friday's practice with a hamstring injury, Tom Silverstein of the Milwaukee Journal reports. Analysis: The severity of Mays' injury isn't clear, and it's therefore hard to say when he'll be back on the field. The 2017 seventh-rounder is trying to stick as the No. 4 running back behind Ty Montgomery, Jamaal Williams and Aaron Jones. 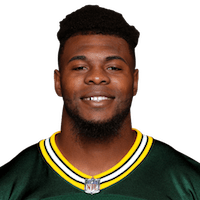 Mays returned to the Packers' Week 17 loss to the Lions after suffering a shoulder injury, according to Rob Demovsky of ESPN.com, and finished the game with one carry for two yards and three receptions for no yards. Analysis: The four touches upped Mays' total touches on the year to seven, as he played a bit role for the Packers in his rookie season. The team liked him enough to keep him on the roster all season, but he will be behind fellow rookie runners Aaron Jones and Jamaal Williams on the depth chart moving forward, so he is going to have to compete to hold onto his spot in 2018. Mays injured his shoulder during Sunday's game against the Lions and his return is questionable, Rob Demovsky of ESPN.com reports. Analysis: The Packers are already thin at running back with Aaron Jones (knee) and Ty Montgomery (wrist) both sidelined, so Jamaal Williams is slated to see a majority of the reps out of the team's backfield for the remainder of Sunday's tilt. If Mays is able to return, it's unlikely he'd see many snaps on offense with Williams at full health. Packers head coach Mike McCarthy said Wednesday that Aaron Jones' (knee) expected absence for the season finale against the Lions would likely open up snaps for Mays, Michael Cohen of the Milwaukee Journal Sentinel reports. Mays didn't play any snaps on offense in Sunday's 31-28 loss to the Steelers, Rob Demovsky of ESPN.com reports. Analysis: After fumbling on his first two NFL carries the previous week, Mays was merely active in case Jamaal Williams suffered an injury. The Packers used fullback Aaron Ripkowski on some passing downs to give Williams a breather. With Williams doing solid work and Ty Montgomery (ribs) potentially nearing a return, Mays doesn't figure to get many snaps, if any, in Week 13 against Tampa Bay. Mays (ankle) is active for Sunday's contest in Pittsburgh, Jason Wahlers of the Packers' official site reports. Analysis: By process of elimination, Mays was expected to play Week 12. First and foremost, Aaron Jones (knee) and Ty Montgomery (ribs) were near certain candidates for inactive status, which came to pass. Plus, May finished the week with back-to-back uncapped sessions. While Jamaal Williams is expected to be the lead back Sunday, Mays will attempt to redeem himself after fumbling twice on his three carries last Sunday against the Ravens. Mays (ankle) was a full practice participant Friday but is listed as questionable for Sunday's game in Pittsburgh, Rob Demovsky of ESPN.com reports. Analysis: Mays was a limited participant Wednesday but returned to full sessions Thursday and Friday. With Aaron Jones (knee) ruled out and Ty Montgomery (ribs) doubtful, the Packers presumably would've signed another running back by now if they were actually worried about Mays' availability. The rookie seventh-round pick figures to work behind Jamaal Williams in a tough matchup on Sunday Night Football. 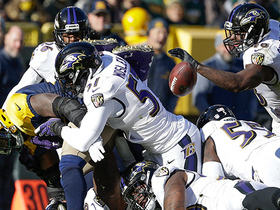 Mays fumbled on his first two NFL carries in last week's 23-0 loss to the Ravens. Mays (ankle) practiced fully Thursday, Rob Demovsky of ESPN.com reports. Mays was listed as a limited participant in Wednesday's practice with an ankle injury. Mays had three carries for minus-one yard and lost a fumble in Sunday's 23-0 loss to the Ravens. Mays is in line to serve as the top understudy to Jamaal Williams in Sunday's game against the Ravens with Aaron Jones (knee) out and Ty Montgomery (ribs) considered unlikely to play, Wes Hodkiewicz of the Packers' official site reports. Mays was inactive for Sunday's victory over the Bears, but he could have a chance to play in Week 11 if Ty Montgomery (ribs) and/or Aaron Jones (knee) are unable to play. Analysis: Mays has suited up just three times this year -- and not at all since Week 5 -- but chances are he would be in uniform for the Packers' next matchup with the Ravens if either Montgomery or Jones is unable to go. While doing so would at least give him a chance to see the first action of his NFL career, it would likely take absences from both players for him to have any sort of defined role in the game plan.